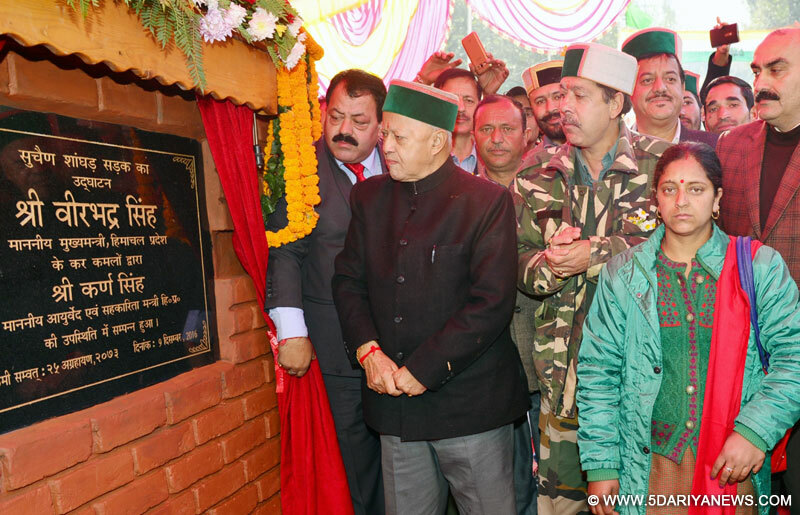 Chief Minister, Virbhadra Singh while addressing a public meeting at Shanghad, a remote village of Kullu in Sainj Valley, said that our deities were inseparable part of the people of the State and their presence was felt in all our happiness and sorrows. It is responsibility of all of us to preserve and protect our ancient temples, he said, adding that it was also our duty to preserve our customs, language and traditions. We are known by our traditions and culture, he said adding that our deities protect us from every evil.Giving a message to the coming generations he said that he wishes they may prosper leaps and bounds, but together with this , they should also not forget their culture and customs and maintain them at all cost. He said that those who forget their customs and traditions vanish slowly with passage of time. "I am proud to be a Pahari, and I use to say the same when I was Member of Parliament and Minister in the Centre." The youth who are studying in other states should not feel ashamed of their culture and considering themselves as Paharis, he said. Chief Minister said that it was after ages that anybody from his royal family had come here and sat on the historical Seat which had been gifted by Shangchool devta and established here.He said that the area was full of natures bounty and since it had been connected with road today, I hope, that many people would now visit this place to pay obeisance to Shangchool devta, and said the road would be widened and metalled in future. He said that we have deep rooted culture and stand like a strong tree.He participated in 'Pratishtha' ceremony of Shangchool Mahadev temple in the remote belt of Sainj valley at Shanghad. The ancient temple of Shangchool deity was destroyed in fire and was reconstructed in ancient traditional architecture and aided by the State government. He said that my motto was to develop all areas alike without any discrimination of upper or lower Himachal. We have treaded fast on path of progress particularly in the field of education and were awarded and recognised as Best Big State in the country in the field of education and inclusive growth. The Chief Minister said that the government had opened 42 colleges in last 48 months and the strength of colleges today was 116.He said he was criticised by opposition for opening many schools, but I want to make them clear that just because of their criticism, I can't leave any child uneducated in the State. He said that BJP criticise the present Government just for the sake of criticism and the Congress believes in healthy criticism. He exhorted the people to find the good in everything bad. He said the vast open pasture and the natural beauty of this place should be maintained at all cost. The trees should be protected and so the environ of this place, he appealed to the people. The Chief Minister earlier dedicated Suchehan-Shanghad road completed with an outlay of Rs 2.45 crore. The newly constructed eight kilometres road would provide all weather connectivity to the resident of Shanghad and the facilities to transport their produce. The road connecting the remote area of Sainj valley would lead to strengthen the economy of the people of the area.He also laid the foundation stone of drinking water supply scheme Dugedi, Konsha, Berra-Shanghad, Dhara-Lapah, Tandi-Nihai and Lotla-Tung to cost Rs 2.41 crore. This would benefit 42 habitations and a population of 4500.Ayurveda Minister Shri Karan Singh along with his wife Smt. Shivani Singh welcomed the Chief Minister and other dignitaries on the occasion.President, Shangchool Mahadev Temple Committee Shri Tek Singh welcomed and honoured the Chief Minister. He said that it was for the first time that a Chief Minister had visited Shanghad and for which he was grateful to him. He also raised few demands of the area and thanked Chief Minister for dedicating the road and laying foundation stone of IPH scheme for the villagers. He said he was indebted for whatever the Chief Minister gave for Banjar constituency in terms of development. Secretary HPCC Shri Sunder Singh, former Minister Shri Satya Prakash Thakur, District Congress President Shri Budhi Singh Thakur, District Mahila Congress President Ms. Vidya Negi, President Banjar Mahila Congress Ms. Pingla Bhandhari, BCC Manali President Shri Bhuvneshwar Gaud, Vice-President BCC Banjar Shri Surender Sharma, Chairperson Zila Parishad Ms. Rohini Chaudhary, President Mandi Parliamentary Youth Congress Shri Adityavikram Singh, Deputy Commissioner Shri Yunus, SP Shri Padam Chand and Pradhan Gram Panchayat Shanghad Ms. Savita Devi were also present on the occasion amongst others.